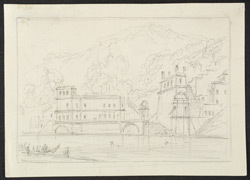 Pencil drawing of the main ghat down to the river at Haridwar in Uttar Pradesh, by Thomas (1749-1840) and William Daniell (1769-1837), 7 April 1789. Inscribed on the back in pencil is: 'Principal Gaut at Hurdwar.'. This is the original drawing for H. Caunter, 'Oriental Annual' (London, 1834), 245.